In March I did the unthinkable….. went on a cruise. You’ve probably seen the ‘Northern Lights Cruise’ adverts featuring a stunning photograph of the Aurora set in a spectacular Norwegian landscape. Closer inspection revealed that almost all these promotional images were taken from dry land, but whatever, I was hooked. The company (Hurtigruten) guaranteed a free trip if the aurora didn’t make an appearance, and they offered a 5% discount to RSPB members AND a donation of 10% to the RSPB. It looked quite a good deal, really, for all concerned. I discovered that the only Hurtigruten ship with a significant number of single cabins was the M.S. Lofoten, now more than 50 years old, so it was on her that I booked. 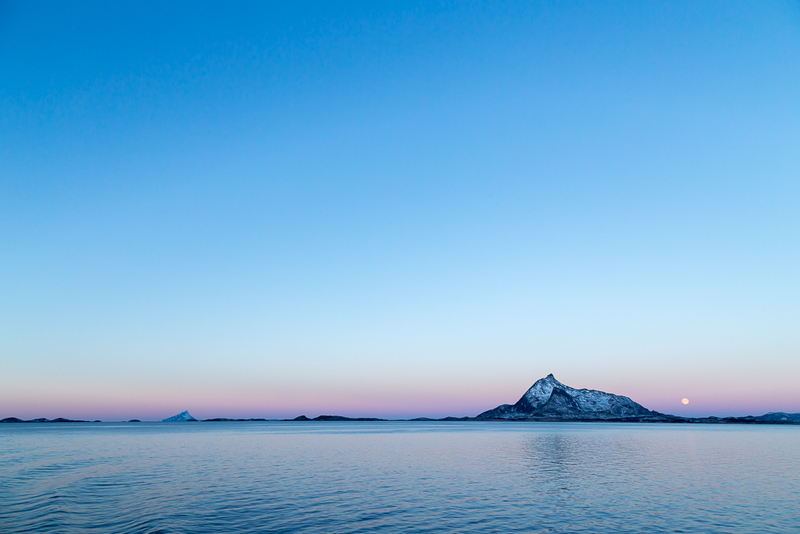 The unique feature of a Hurtigruten coastal cruise is that you are actually on board a daily service vessel carrying goods, passengers and mail up the west coast of Norway from Bergen to Kirkenes, close to the Russian border, and way north of the Arctic circle. 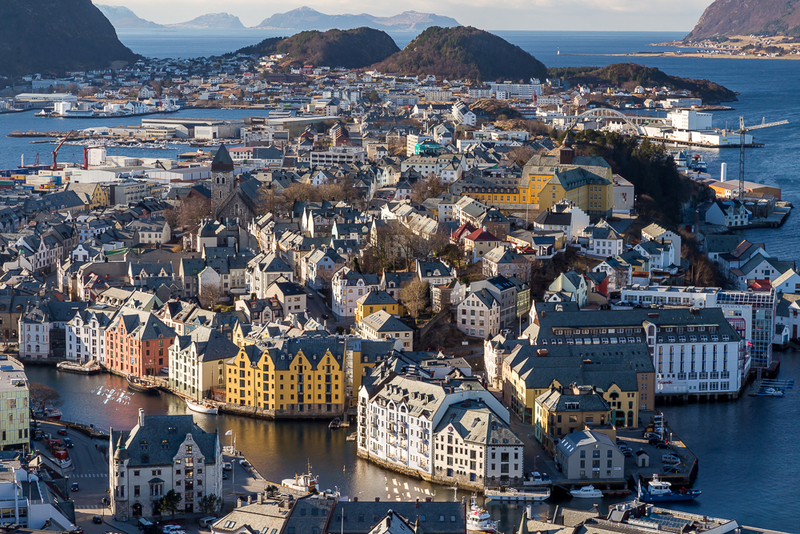 The ship calls into a total of thirty-four ports on the journey in each direction, ranging from Trondheim, the second-largest city in Norway and once its capital, to tiny fishing ports in the far north like Honningsvag and Kjollefjord. Some visits last for three hours or more, allowing a short exploration, while many are for only thirty minutes – just enough time to drop off and pick up a few passengers and some mail. The first full day of the cruise was clear, cold and sunny, conditions which were to be repeated on seven of the ten days that the journey took, with sub-zero temperatures night and day. There was, however, no more than a light breeze at any time, unlike back home in Wales, where the Beast From The East was howling across the country. For the most part the ship takes a route between the Norwegian mainland and its many offshore islands, so the voyage is more sheltered than you might imagine, even in windy conditions. There are a few stretches of open water, the longest of which is around the North Cape and across to Kirkenes at the edge of the Barents Sea. Indeed it was here that we encountered the only rough conditions of the trip – a swell which threw one diner out of his chair and caused much discomfort to some passengers. I think my stomach must be made of steel! Otherwise the weather was ideal for a safe and comfortable sea journey, but not really for the landscape (seascape?) photographer. I hate to admit it, but it became a little monotonous at times, and I got a bit tired of seeing snow covered cliffs soaring out of the sea into a clear blue sky. If only there was some cloud around! 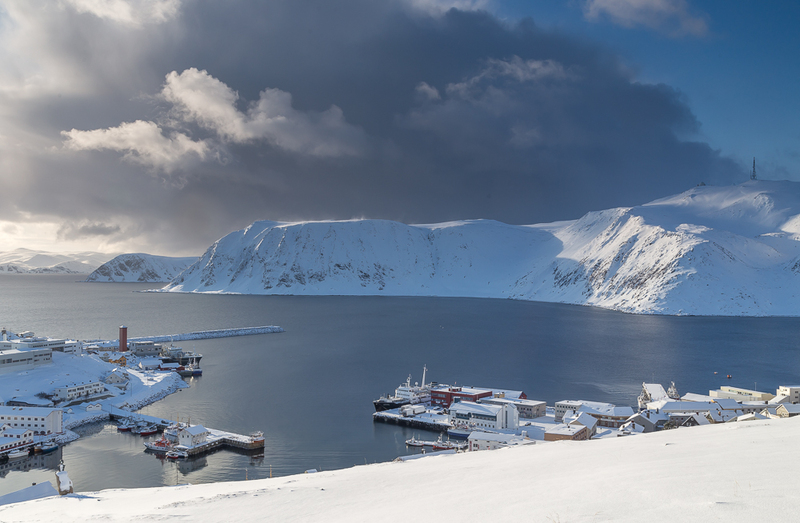 Only on one day were conditions really ‘interesting’: around the North Cape where heavy snow showers fell from large threatening clouds (see the top pic). Birdwise it was pretty quiet, which is not surprising bearing in mind the time of year. Great black-backed gulls, shags and cormorants were common everywhere, and kittiwakes became more frequent the further north we went. Waterfowl included eider, long-tailed duck, and the ubiquitous mallard; there were a few spectacularly-plumaged male king eiders, and the occasional “whatever was that?” that flew past the ship. White-tailed eagles were probably the highlight: single birds or pairs could sometimes be seen perched on the flat tops of tiny skerries, quite likely to be their nest sites later in the spring. At one time nine were in the air together. One night I went on to the deck in the dark just as ship’s spotlights picked out a flock of what appeared to be waders on the water; could they actually have been little auks? At one point in the far north it was announced over the ship’s intercom that a group of orcas had been seen; the ship pulled up and turned round just in time for passengers to see a tight group of tall, vertical fins heading off at a rate of knots. To follow Tales from Wild Wales, please scroll down to the bottom and click Follow. Thanks Mrs B. The Hurtigruten route only takes in the fjords at certain times of the year, but I’m sure that would be fabulous as well. I took this Hurtigruten cruise a few years back in the summer. Loved it and absolutely the best scenic views in the world! In summer I don’t know how anyone would find the time to sleep and eat! All that stunning scenery passing by……….